—Or lack of it. There’s no denying that, over the last decade, ratings for soaps have dwindled considerably. And now, the end for two of my favorite shows is on the horizon. Yes, it is a bleak time for all soap fans. The end of an era. Which is why I need a Plan B. You may recall that last fall, I wrote a post (see My Life in Soaps) about where I want to live when I retire: Llanview, USA. I thought it would be fun to spend my golden years living in a soap. Not just any soap, but my soap du jour, One Life to Live. After all, the people there are like old friends. Well, no can do. ABC Television has pulled the rug from under me, thanks to their decision to pull the plug on One Life and All My Children. How can this be, you ask? I have been asking this myself over and over. I’m miserable, verklempt, trying to make sense of all this, while feeling a terrible, aching sadness. Soaps have been part of my life for as long as I can remember. Over the years, these shows have seen me through good times and bad. I started watching when I was a freshman in college and discovered that, for many of my classmates, the place to be, weekdays at 1:00 pm, was glued to the tube watching AMC and One Life. In fact, so many of them planned their course schedule around these soaps (Remember, no DVR’s back then!) that I think the university decided to play it safe and not schedule classes during the midday. Come 1:00 p.m., you could find at least 20 of us squished into one dorm room—the only one on the floor with a TV—passionately watching the travails of the Martins and the Tyler’s, the Buchanan’s and the Lord’s. In no time, I was addicted, and I’ve been getting my fix ever since. Susan Lucci plays Erica Kane, the infamous vixen on All My Children. Soaps can be a special bonding time for mothers and daughters. My daughter, Sarah, whose middle name was borrowed from a character on All My Children, discovered the world of soaps one day when she was nine and home from school with a cold. Up until then, I hadn’t let her watch the shows, but the storyline that week was coming to a head, and I just had to tune in. After a few scenes, Sarah looked at me and said, “Isn’t anyone ever happy on this show?” Nope, because if they were, it wouldn’t be for long and it certainly wouldn’t be a soap. And just like that, my daughter was hooked. Soaps tackle social issues to teach invaluable lessons: Recently, One Life has had a storyline about bullying. It’s been heart-wrenching to watch, but so timely in light of the culture of bullying that has been prevalent throughout the country. Other issues soaps have covered: addiction, domestic violence, homelessness and racial prejudice. Many actors launched their careers on soaps: Amanda Seyfried, Courteney Cox, Alec Baldwin, Leonardo DiCaprio, Brad Pitt, Meg Ryan, Demi Moore, Kevin Bacon, Tommy Lee Jones, James Earl Jones, Sarah Michelle Gellar, Marg Helgenberger and Susan Sarandon. The list goes on. Stars are soap fans, too: Many celebrities who are fans themselves have vied for a cameo on a soap, including, Carol Burnett, Snoop Dogg, Betty White, James Franco and Oprah. Heck, even Warren Buffett has had his 15 minutes of fame on a soap. Even in its demise, soaps bring people together. One Life’s Facebook page has more than 11,000 comments from people bemoaning the cancellations. Soap operas have the most loyal and devoted fan base of any television genre, which makes this the worst decision in the history of television, if you ask me. ABC has promised to “conclude each series in a manner that respects their legacies and the longstanding hopes of many of their viewers.” Well, I for one will keep watching until the bitter end. And on the day of the last episode, don’t look for me. I’ll be in seclusion, wearing my black armband, and holding back my tears. So long One Life! Fare thee well, All My Children! Your fans will never forget you. I know! 😦 It makes me so sad. The end of an era, if you ask me. First thought that went through my mind — what is Susan Lucci going to do? (I mean, besides infomercials). Maybe she’ll sit around eating nachos and put on those ten pounds that she really needs. But seriously, I spent a lot of years addicted to AMC and GH. But who sits down to watch tv at 1 p.m. anymore? Susan Lucci recently wrote a book. So she’ll tour and talk about the book and how AMC shaped her life. Then she’ll be given a talk show and write a cookbook and do Law and Order. I’m not worried about her. I think about all the other lesser-known actors and the hundreds who worked behind-the-scenes. What will happen to them? Who knows. Oh Monica! Change can be so painful… But think of all the wonderful yet to be discovered wonders that you will be able to replace your favourite soaps with!! I think it’s like some kind of critical mass thing, that I sort of started watching “One Life to Live” and saw a couple of episodes of “All My Children,” just a few weeks before their cancellations. A couple of things struck me: I couldn’t get into AMC at all because the stories made me want to slap somebody. (The writers, perhaps?) And I was only watching OLTL because I felt nostalgic about Vicky and that grown up girl playing Todd’s daughter, who was such a good child actress as she came up with complicated plots to fix her Dad’s messes, back in the day. Maybe it’s because I’m working so hard on getting better at my own writing that I kept trying to figure out how one can write fresher plots, make them not seem so stilted, and keep viewers coming back, all at the same time in this opened-up twenty-first century world. Very tall order! Even as an armchair quarterback, I couldn’t figure it out. I do have to say, that as far as “soap operas” go, I haven’t found a better one for me than “Bettheny Ever After.” Maybe these have become the soap opera’s competition. Maybe soon, these will be what a person chooses from when they decide which of the “stories” to follow. I think you’re on to something regarding AMC. I stopped watching it a few years ago because just about all the storylines were making me crazy. Up until then, I’d been watching both AMC and One Life. Both shows have their ups and downs, but when the storylines good, it’s exciting. But when it’s bad, you should hear me yelling at the screen. Thanks for your input. I guess I’ll have to check out Bettheny Ever After. So far, I’ve been reluctant to watch reality shows. I got hooked on “Another World” when I was seventeen (I fell in love with Ray Liotta!). I started watching “General Hospital” too, because it came on right after AW. When AW was cancelled in 1999, I’d been watching it for more than 20 years. I never watched another soap after that! That was very smart of you, to stop watching. I actually stopped for several years when my kids were very young. But around the time my youngest was 8 I happened to be home one day and got hooked all over again. That was 12 years ago. How time flies. It’s going to be hard to live in a world without my soaps. Unfortunately, you can’t buy the dvd’s. They just don’t make them. 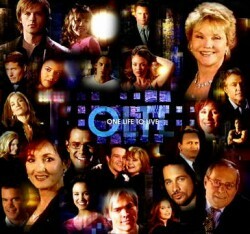 I used to be a regular soap opera fan, “Days of our Lives” being my favorite. I have not been a soap opera for years now. I can’t imagine a world without “Soap Operas” Oh well times are changing-in fact it gets scary at times-when you stop and wonder how things will be in another ten years or earlier-since its going so fast ! in fact too fast !!!! I agree. I can now earnestly say that I grew up in the olden days, when things were oh so different, and soap operas on TV were in their heyday. And variety shows ruled the nights! Now it’s all about the reality shows. These are the exact reasons I’ve watched soaps off and on ever since I was younger (although, to be completely honest, I was more of a Guiding Light fan). I remember when I was home sick from school and it was my mom’s turn to stay with me, we would be watching soaps. It’s sad watching them go dark like this. I think everyone has been watching them on the soap channel. Sad. I heard recently that the Soap channel is also being eliminated. Sad, indeed.